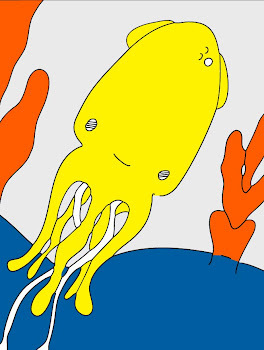 Technicolor Squid: Pink Bubbly Champagne. My Etsy shop is open!! Yippee ka doo! There is the very limited run of 25 coloring books for sale along with a few packs of stickers. My goal is to add new types of items weekly (jewelry, books, plushies etc.) so I hope that you keep checking back. I also have a lot of favorites. If something of mine does not interest you, please check out those other incredible artists! And yes, if you enter the word “Yippee” into the “Message to Seller” box during checkout you will get one Free Shy Monsters Coloring Sticker with each item purchased! I hope the champagne does not make you tipsy for shopping *wink wink* Thank you for your support, for your encouragement, and for joining me in this celebration!